Two outs, two strikes, the losing streak about to come to an end. Suddenly it was as if Danys Baez remembered, “Oh, that’s right, I’m supposed to blow this thing.” And he did. Plenty of O’s played a role in last night’s demoralizing defeat, a 5-4 loss to the Devil Rays that extended the losing streak to eight, but the bullpen is an easy target these days. Not to mention that Baez literally looked scared when MASN did a close-up of him right before he blew the lead. That’s loss No. 32 for the bullpen, if you’re counting, but the good news is that their ERA actually dropped last night, falling from 5.85 to 5.78. Take that, baseball critics. Meanwhile, Aubrey Huff would have Ruthian numbers if he could just play the Devil Rays every night. My wife redefined Oriole Magic during last night’s game, and I like her thinking. Oriole Magic used to mean late-inning comebacks; now it’s “Magic! Magic! Magic! Magic!” if the Birds hold a late-inning lead. I’m calling it now – the losing streak ends tonight. This was all just a tribute to our favorite No. 8, Cal Ripken. I don’t want to seem unappreciative, but it’d be a better tribute if Mr. Angelos would sell the team to No. 8. The latter video, in which Chito gets two hits off of Jack McDowell and makes a nice catch in right field but forgets how many outs there are, also features Sam Horn and a slim version of Randy Milligan. Chito played parts of with three seasons the Birds and in the process became the first Major League player from Belize. Apparently the feat made him a national hero in his home country. He was a hometown hero for the Roar from 34 writers, as we joined a chorus of “Chito” cheers one night in the rightfield bleachers at Memorial Stadium. Other players who debuted along with Martinez in 1991 included Jeff Bagwell, Bernie Williams, Ivan Rodriguez, Eric Karros, Jim Thome, Kenny Lofton, Royce Clayton, the late Rod Beck, and the late Darryl Kile. All chumps next to Martinez, if you ask me. 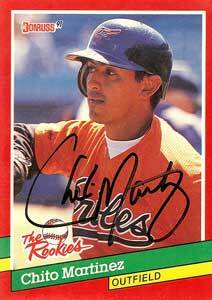 I wonder what Chito Martinez would have to say about the O’s current woes. Where have you gone, Chito Martinez? What a strange coincidence that you mention Chito Martinez. Just this morning, before I saw your blog, I posted to a Belize message board asking whatever happened to him.I’ll let you know if anyone responds with news of Chito or his whereabouts. You came through for me again. Thanks for the laugh! If only the bullpen were so reliable. That is, reliable in a way that wouldn’t cause me to have a sharp, squeezing kind of pain in my chest.I had never heard of Chito and didn’t recognize the other players mentioned, then realized that was during the dark years when I was in Tampa and had no access to baseball. ::shivers:: Those were hard times.I enjoyed the videos and seeing a bit of my old home. My favorite quote is this one, “Pitching has been poor this year. The Orioles are having a tough time winning this year.” Ah, some things never change.I don’t usually pray, but I think tonight I’ll give it a try. Let me know if your search turns up any results, misterb. awesome vids …nice work.i, too, should like to know QUE TAL CON CHITO HOY? Chito’s son, Drew, a freshman, is playing for the University of Memphis this year (’09). He is from Collierville, TN and played at CBHS (Memphis). Thanks for the tip on Drew Martinez. Out of curiosity I came to this site to find out more about Chito Martinez, who I recently met.I didn't know he had been a professional baseball player. It was a comment made by a young man that piqued my interest.I don't know if Mr. Martinez cares to share his life publicly so I will not go into details. This much I will say, he is well and lives in the United States. I appreciate the update. Glad to hear he's doing well. This is funny, I am actually Chtio's middle son and i was looking my dad up and found this page. Drew his oldest plays at memphis (CF-Junior) and will be drafted this coming draft. Dalton is his middle son plays at Jackson State CC (SS-Freshman). Chitos doing well.